In almost every jury trial I have participated in, the Liebeck vs. McDonald’s (i.e. the hot coffee case) has been referenced during jury selection. A prospective juror’s view of this case and of the larger issue of tort reform can be a keen insight into whether or not that juror would be a good fit on a personal injury jury. The McDonald’s hot coffee case was also significant in that it was Exhibit 1 in the tort reform movement that made it more difficult for Plaintiff’s to bring lawsuits and recover damages. You almost certainly have heard of the McDonald’s hot coffee case and you probably know the broad strokes of the case. However, the actual details of that case have been lost or muddled through numerous retellings. 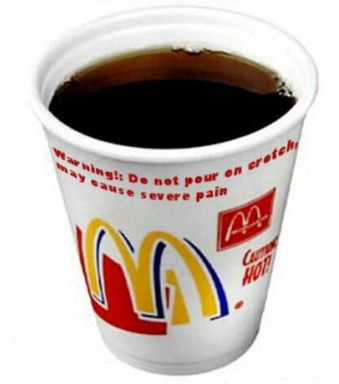 The McDonald’s hot coffee case became the poster child for “frivolous lawsuits” but many of the people who villainized the case were not aware of the correct facts. There was an informative documentary done on this case called “Hot Coffee” that ran on HBO for a while. It is worth a watch in order to learn the true facts of the McDonald’s hot coffee case. Also, the New York Times had a nice video clarifying some misconceptions of this case as well. Myth: The Plaintiff was driving when she spilled the coffee. Fact: The Plaintiff was a front seat passenger riding with her nephew at the time of the spill. Myth: The Plaintiff was in a moving vehicle at the time of the spill. Fact: The Plaintiff was parked in the McDonald’s parking lot at the time of the spill. Myth: The Plaintiff only received minor injuries as a result of the spill. Fact: The Plaintiff received burns over 16% of her body including some third degree burns which required extensive skin grafts and $10,000+ in medical bills. Myth: The Plaintiff was money hungry and looking to hit the lawsuit lottery. Fact: The Plaintiff initially requested that McDonald’s only compensate her for her medical bills and lost wages, which totaled around $20,000. McDonald’s offered her $800. Myth: The coffee was not that hot. Fact: Expert testimony showed that the coffee was 30 degrees hotter than it needed to be. Myth: The Plaintiff struck it rich from this case. Fact: The jury awarded $2.9 million but the judge reduced that amount to $650,000. The Plaintiff reportedly settled for less than $500,000. She still had to pay for the litigation and trial and pay her attorney. Her net amount in her pocket would have been far less. Before you make any judgments regarding this case, please make sure that you have based it on the real facts.